You ask: Why should I use ACRYLITE® acrylic sheet in place of standard glass? Unsurpassed beauty, warmth and elegance! Creative design flexibility! Caring Performance! There are so many compelling reasons to use ACRYLITE® acrylic sheet in place of glass. Glass is tried and true - it has been around for hundreds of years. Using glass has made it possible to bring the warmth of daylight into our homes and buildings while keeping the bitterness of weather outside. We owe much thanks to this hard working material. While properties like transparency, stiffness, and strength have helped to make glass successful, it has been limited by other properties. Its brittleness and heavy weight as well as the difficulty of cutting, shaping, coloring, and decorating glass have imposed limitations on designers, builder and architects, alike. Fortunately, there is an alternative - acrylic sheet. Acrylic is much tougher than glass, at half the weight, is easy to fabricate and form into a variety of shapes, comes in hundreds of colors and is readily decorated. It provides a new level of flexibility and allows ideas to take shape. It sets designers free! Why use ACRYLITE acrylic sheet in place of glass? Plexiglass is HALF the weight of glass! Plexiglass is up to 17 times more impact resistant than glass! (use the figure of 1.5lb per SF for 1/4" thick Plexiglas. Warmth! Acrylic feels warm to the touch, not cold like glass, because it is a better heat insulator. Compared to glass it has a lower coefficient of thermal conductivity. sparkle and elegance of acrylic. Unlike glass, colorless acrylic sheet has essentially zero absorption of visible light. Creative Design Flexibility! ACRYLITE acrylic sheet is available in a nearly unlimited array of standard, custom and designer colors. Smooth and etched surface finishes can be combined with eye grabbing colors to produce thousands of unique and exotic looks. CYRO Industries can custom match almost any color in ACRYLITE® GP acrylic sheet when modest minimum order quantities are met. 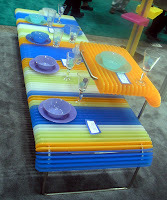 Acrylic can be cold formed into modest radii or thermoformed into flowing curves and shapes. Acrylic's excellent thermoforming properties will help ideas take shape. Custom sizes and unusual shapes need not be a concern. Acrylic sheet is readily cut, routed or machined into intricate shapes and sizes using typical woodworking equipment. CYRO Industries can provide expert advice on appropriate blades, tooling and procedures to insure success. Acrylic is easily decorated. It can be painted, engraved, or hot stamped. There is no need to accept the limits of glass, with acrylic, ideas are set free!! Where can acrylic be used in place of glass? below along with the benefits of acrylic. substituting acrylic for glass. CYRO's Technical Service Department can also provide assistance. * Mechanical strength and stiffness. Acrylic has lower tensile strength and stiffness than glass. When used in glazing, the requires thickness will usually be 1.5 - 2.5 times greater than that required for plate glass to withstand the same wind loads. When used for shelving the required thickness to support the same weight will beat least 2.5 times greater than that required for plate glass; however acrylic will offer much greater impact strength. CYRO's TechnicalService Department can provide design assistance. * Expansion and contraction allowances. Acrylic expands and contracts more than glass due to temperature and humidity changes. Its coefficient of thermal expansion is about 8 times greater than that of glass. Proper allowances must be made to permit expansion and contraction. CYRO's Technical Service Department can provide assistance. The surface of acrylic is not as hard as that of glass. Therefore, it is more prone to scratching and abrasion. If resistance to scratching and abrasion is important, then specify ACRYLITE® AR Abrasion Resistant sheet.This revolutionary acrylic sheet has a "glass-like" coating on one or both surfaces that resists scratching. chemicals. Standard glass cleaners can be used to clean the coated surfaces of ACRYLITE AR acrylic sheet. Acrylic is a combustible thermoplastic. Be sure to consider all applicable building code regulations before substituting acrylic for glass. The acrylic sheet stronger than glass. But how many % stronger? 25 mm glass = max. ? mm height aquarium? 25 mm acrylic = max. ? mm height aquarium? In Hungary maximum 25 mm thickness acrylic buy.